Based in Denver, Colo., Brenda Goodnough has been writing articles in the health and fitness field since 2007. She holds a Bachelor of Science in health and exercise science from Colorado State University and holds certifications in Personal Training, Sports Nutrition, and Lifestyle and Weight Management. Many people enjoy a cup of coffee in the morning. Caffeine is a bitter substance found naturally in coffee beans. Whether you need a to jump start the day or just enjoy the flavor, all forms of coffee contain caffeine. The amount of caffeine varies depending on the type of coffee -- regular versus decaf -- serving size and how it is prepared. According to the United States Department of Agriculture National Nutrient Database, the caffeine content in Folgers caffeinated coffees is 71 mg per 6 oz., 95 mg per 8 oz. and 12 mg per ounce. Folgers Classic Roast Half-Caff blend provides half the amount of caffeine as its caffeinated blends. The caffeine content per 6 oz. is 35 mg. It is 48 mg for 8 oz. and 6 mg per ounce. The USDA National Nutrient Database states there are 2 mg of caffeine in each 6 oz. or 8 oz serving of Folgers decaffeinated coffee. Trace amounts exist in a 1 oz. serving. 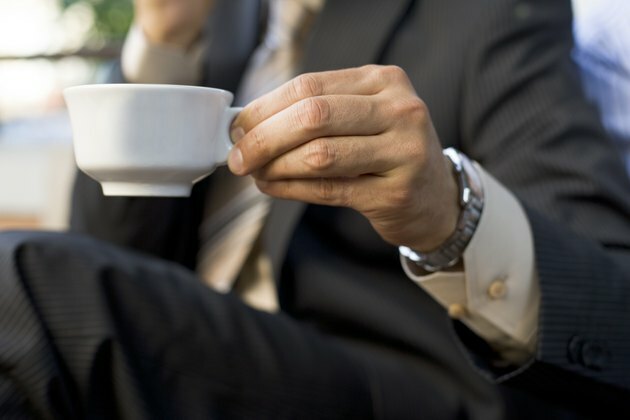 According to MayoClinic.com, consuming 200 to 300 mg of caffeine per day, or about the amount of caffeine in 2 to 4 cups of coffee, is not harmful. However, if you consume 500 to 600 mg of caffeine per day or more it can cause a rapid heartbeat, insomnia, muscle tremors, irritability, nervousness or an upset stomach. The caffeine content in Folgers coffee falls within the safe guidelines if you only drink one or two cups in the morning.